Reckong Peo, the District Headquarters of Kinnaur is 235 Kms. from Shimla. National Highways -22 is the most convenient communication network to Kinnaur. For those who can afford it, jeep and taxies are the best way to go to Kinnaur. For a round trip with a fixed schedule, a lumpsum contract for the entire duration would be the less expensive option. For those travelling with the flexible schedule, taking in treks and visits to valleys off the main highway, it is best to make a per day arrangement for a specified time period. In the alternative, take one way taxis to Kalpa or Reckong Peo and hire other taxis locally as and when needed. Buses ply regularly, except in winter and early spring when road conditions often impose long breaks. 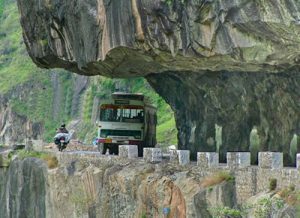 Himachal Pradesh Transport Corporation runs a number of buses to different parts of Kinnaur. There is one direct service from Shimla to Kaza plying on the Satluj valley route, which takes 24 hours. In Kinnaur, at least four bus routes connect Reckong Peo with Shimla every day and other services go to Nichar, Sangla and Pooh. Day services to travel to places within Kinnaur are also available but with less reliability than the long distance routes. 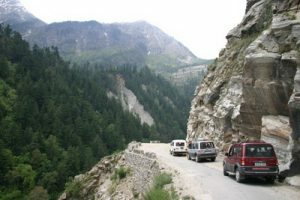 With drive to kinnaur very adventerous, care is to be taken while driving. Long suspension bridges connect two bank of the Satluj river at many places. The road condition after the flash floods in August,2000 is not the best. With blocks in some places in winters and rainy seasons it is always advisable to get information about the road condition and then start the journey in these months. The other route from Manali-Kaza-Recong peo remains closed in most part of the winters and springs. There is no direct flight to Kinnaur and the nearest Airport is Shimla which can be reached from Delhi.